So, more and more I see people putting “I feel that…” into conversations regarding the rules of this game. An example of which is the INAT FAQ, where the organizers change and make up rules to suit themselves. If you don’t believe me, look at their Tyranid section, then how they go around to define weapons as “hull-mounted” when the codex does not, the difference being a huge change in line of sight of the weapon. So I am here today to lay some ground rules to go by when assessing whether or not something is supported by the rules. To begin this multi-segmented article, I will show the four basic gates of logic, as well as their relevant truth tables. Ambiguity cannot be tolerated, for logic necessitates absolutes; all terms that people consider ambiguous will be defined for the purposes of examples. For those unfamiliar with binary, 1 means true, 0 means false. Generally, A and B will be used for examples. Essentially, this gate boils down to that both sides of the symbol must be true in order for the sentence as a whole to be true. For it to be true I had a burger and a drink (A*B), I really do have to have a burger and a drink, for it is false otherwise. An OR gate claims that at least one of the pieces are true. I have either a quarter or lint in my pocket (AvB). Turns out that I had lint, but it is still true. This is the trickiest of them thus far, for it states that we do not have A true and B false. If I eat a burger, then I will get fat (A>B). For the purposes of “not”, ~ will be our requisite symbol. OK, now that I’ve done all this, what the hell is the use? Unlocking language, in a sense. If you include Pedro Kantor, then your guys exchange Combat Tactics for Stubborn and your Sternguard gain the Hold the Line! Special rule. So, how does this reduce to logic? Yet, players have stated that you can combine Vulkan and Pedro to form the Wonder Twins! Continuing on, the rules state that if you have more than one character, then you must choose which of their Chapter Tactics will be used. This reduced in to logic in this fashion: It is not the case that if you take Pedro and Vulkan that you gain both Chapter Tactics. At this point, we must affirm one, or deny the other to get any result at all! Now, there were some things I did in here that I will be covering next time in my quest for the Holy Grail of rules lawyering, and these are called the Simplification and Inference rules! Fritz, a blogger of much renown, has brought up a good point that I have been trying to incorporate into my Tau cadre and I think others can work into their army as well. Fritz calls his new paradigm a "null deployment," but it is simpler than that. The strategy is essentially the same that he has been proposing for his Saim-Hann army for months: using mobility to exert maximum force to one point. Fritz' new concept is a different tactic to accomplish this strategy, but it is still the same strategy. I do appreciate that this tactic is based around using the USRs we can neglect and using units to their best. The advantage that Saim-Hann and generalized mechanized eldar have is due to their speed. Every vehicle in their armory is a fast skimmer, capable of firing at essentially full effect after moving 12" or moving 24 or 36" for the daring. Very few other fast skimmers exist and of those only a few have any transport capacity. But this is changing. As Fritz is so fond of saying, the way to fight new codices is not to look at the individual codices, but to look at the trends in them. Fritz is right to say this way of thinking has serious merit; consider the codices written in fifth edition. Space marines, stayed generally the same, but the rhinos got cheaper and with Khan, they gained the ability to outflank. A conditional increase in mobility, but not overwhelming. Imperial guard are able to simply field enough models that mobility does not need to be a problem, but they also got the valkyrie and vendetta, both fast skimmers. This can increase an army's mobility, but is generally only a supplement to the old fashioned chimera. Space wolves didn't get much more than marines and didn't get Khan, so there's a wash there. Tyranids, the army that sparked Fritz' new model, gained an incredible amount of mobility, able to give most everything a drop pod equivalent and the ability to let two units outflank, as well as infiltrators and scouts. 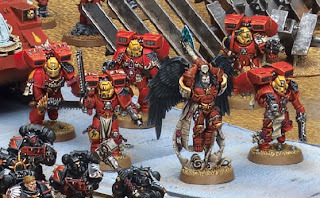 Blood Angels will emphasize deep striking and be able to do so with unmatched accuracy. Fritz' null deployment is based around a wedge force in the deployment zone trying to drive the enemy toward a side where he can outflank and assault them. His deep strikers are intended to corral any strays. His ideas aren't bad at all, but I think they are simply an extension of the trend in 40k that has created the "mechhammer" we see at tournaments. The same needs lie behind mechhammer and the null deployment: the need for protection (especially in the case of troops) and the need to get in an advantageous position quickly. Assault units will be able to take better advantage of the null deployment than shooting units simply because should an assault unit reach CC they will only have to contend with one unit while a shooting unit is a viable target for all enemy units. As Fritz points out, genestealers will be protected from incoming fire if they outflank and may reach their target unharmed. Fritz is a good tactician and there aren't many good answers to this deployment, especially when you play a shooty army that thrives on the edges of the board. I think I've got my answer, but give me a few days. What are your thoughts on the viability of the Null Deployment and how would you stop it with your army? So I figure it's been a long time since I threw a post up. Sorry for my absence, I have been busy with one thing or another. However, there is one positive from being away from the game for a bit. I had a chance recently to observe and host a Tournament here at our FLGS. I am usually wrapped up in thought about my own game, and what I will be bringing to the table, and as a result I usually don't think to much about the aspects of the game. As I passed one of the tables, I looked over and realized it was going to be a no holds, all or nothing brawl between a Very shooty I.G. army versus a very assaulty marine army. This got me to thinking about the differences in overall stat lines between the two armies. With IG having the 3's and marines having the superior 4's across the grid, it proved to be a very interesting game. So lets think for a moment about the two major stat characteristics; Weapon Skill (WS) and Ballistic Skill (BS). This is a pretty straight forward system, and as such doesn't require much thought on a usual basis. Simply look at your number, and then subtract if from 7 and ta da, that's what you need to score a hit. The system is simple, basically following a pattern of for every point in your stat, the less it will take to hit. Obvious after years of playing, and probably for the newer gamers, it isn't hard to understand. Of course the BS 6+ models have an interesting system, but it is pretty easy to get, and there are only like 3 or 4 models out there with it (I am lumping all of the Phoenix Lords together as one here for the sake of argument). But really, for every point you have, it is directly proportionate to the ease at which you hit. Now here is where the system gets a little tricky if you aren't careful. We all know that the same WS will hit on 4's, and if you're is higher you hit on 3's. But what about when your WS is what seems to be ludicrously higher than the opponents. For instance, I have a WS 8 Greater Daemon. Ha Ha! That means those pesky Space Marines hit me on... wait, What!? 4's!?!? That's right, until you hit double plus 1, its 4's. Now what is up with this picture? And Visa Versa, Skarbrand is WS 10, and he still hits those crappy WS 2 conscripts on 3's. There is a way to force my enemies to hit me on 5... should I be hitting them on twos if that's the case? Now... I will pull back here because even though I can see why it makes sense that I should hit on twos... let's think about this in the manner in which it is. A Game Rule. Ballistic Skill requires nothing from your opponent except being courteous enough to loose some models at the end of the shooting. There is no risk here; you simply line up to fire, pull the trigger, hope they take enough to take a moral test, and hope they run away. Especially in 5th, since there are no modifiers for taking an exceptionally high amount of wounds. Just take a test, and your fine. But! Remember, in 5th... it is much harder to kill from a distance. With the amount of cover required, and the fact you must kill all of a unit to really guarantee it won't be a problem later, killing from a far is much more difficult between the two. So, it makes sense that Ballistic Skill require a bit more of a direct reward for each bump in skill. Remember these words well when you think about close combat. Sweeping Advance. This one rule can be a big eye-opener when you think about the To-Hit chart. Yes, it is much harder in comparison to hit in close combat vs. shooting, but when you get a few shots on a unit and kill one or two... it is almost impossible to wipe them completely out, versus getting a good sweeping advance result in melee. For example. I (with my Crimson Fists) took at Tactical Squad (remember these guys aren't exactly master's of close combat with only two attacks each on the charge) and ran into a squad of 10 Chaos Space Marines. With average, and somewhat lack luster rolls on my Power Fist, I managed to kill... a whopping 1. He on the other hand, rolled terrible, and didn't score a single kill on me. He rolled his moral, failed, and rolled a one for the sweeping advance initiative test. I rolled a 4, and proceeded to consolidate having killed all of them now. So, after doing the work to kill one man, I killed all 10 and moved into a piece of cover to make ready for the enemy's rebuttal. But seriously. This to me underscore the simple fact that close quarters is a much more risky maneuver, but has a much higher reward pay-off if it goes your way. So in the end, look at what seems to be the lack of reasoning behind the numbers, and realize that it is in fact a balance to keep the game from being assault unit driven. After all, Ballistic Skill is a simple measure of how god the user is with a riffle. Weapon Skill is a measure of how well you fight in close quarters... but with un-cooperative opponents. WS is almost an Offensive AND defensive stat when you think about it's use in the game. So what do you think of the differences? Do you think it is for balance, or does GW need to see to this when 6th rolls around? Recently BoLS posted an article on how doing something unexpected can throw off a player who has a "tailored" army list, one designed to beat a specific foe. There aren't that many players who have the money to pull out a new army whenever they want to. The simple way to get around this is to not tailor your list to beat any army but every army. That last statement may sound strange, but let me explain. Most armies have some things in common, for instance most transport vehicles are AV 11 or 12 and can move up to 12" per turn. Most armies have some sort of punishing CC unit or some monstrosity that can run rampage in infantry squads. On the flip side, some armies have the ability to send out waves of models and field so many wounds it's tough to kill them all. What's a player to do? First look at what your army doesn't do well, how each your opponents can play that you simply cannot compete with. Look at how these armies fight in that manner. Then look at how you can best bring that threat down and include that in your army. Don't specialize your army, look at weapons and units that can perform multiple tasks in your army and include those units over units that can perform one task very well. For instance, you're fighting Tyranid monstrous creatures, IG mechanized veterans, and a rhino rush Khorne army. What would you need to deal with theses armies, without changing your lists? One solution that springs to mind was posted by Stelek over at Yes The Truth Hurts in his "Fast and Slow" Marine build. 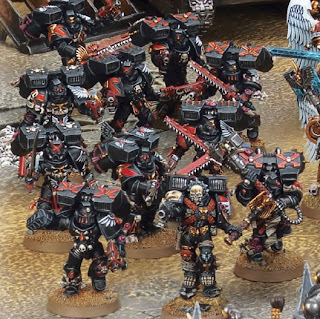 this list focuses on bike squads with two meltaguns and a multi-melta attack bike supported by dreadnoughts with dual twin linked autocannons. The high strength of the autocannon makes it a very good weapon to kill transports and allows it to wound most monstrous creatures on threes and infantry on twos. Melta weapons do this even better, can harm AV 14 and penetrate any armor. Just food for thought, but what do you think about bringing a specialized army as opposed to a generalized army? Hey everyone. I thought I would write this article over something I am noticing more and more. As I continues to play new games, with the same people... I begin to realize that there is a change in players after they have played many a game and read the rule book several times. This is and interesting sight to see, and can often lead to at times great... but other times frustrating moments. 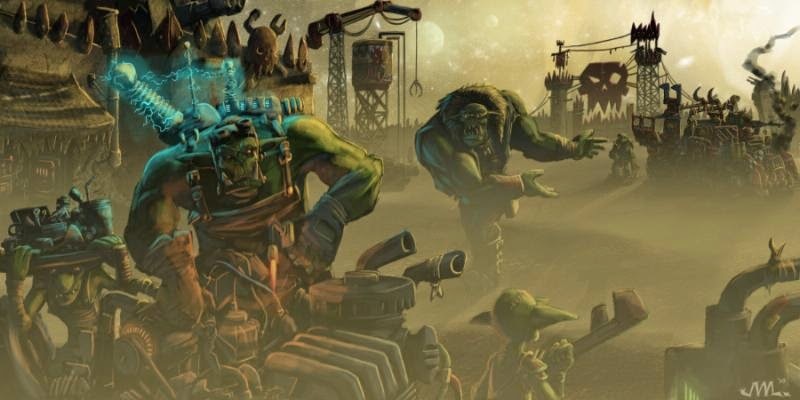 It comes mostly from the idea that some of the newer gamers of the 40k universe will often times find ways to avoid the style of play that some of the older chaps on the battlefield may look at. This is not a harp on the new players, nor anyone... just something I have noticed. Now, I guess I should clarify that I am not referring to the players who have just walked in the door and picked up their army. In this article, I am referring to those who have been playing for a year or two. I know many of the people I play with (Including Ishamael and U.H.) have been playing since 5th began. They know the rules better than I do, but there is an explanation as to why. I have been playing since 2nd, and I'll tell you right now; if you had been playing as long, and through as many editions as I have, you might get some of the older rules mixed up with the new ones like I do. This especially happens with the new 5th edition rules. Anyone who playerd in 4th or prior to that realizes that the overhaul the game received between 4th and 5th was much more drastic than the other revamps. My examples being the use of true line of sight, Running, and the eradication of Target Priority. These are all major changes to the core rules that alter the game completely, and I still have think about when playing. It also doesn't help that I still have yet to been able to round up a 5th edition rule book to call my own, but I won't use that as an excuse. But anyways to the point. After play testing a unique mission today with Ishamael, we found ourselves having multiple discussions over rules quarries. The recent rules debate found all over the community regarding Doom has most likely fueled some of these thoughts... I think. Anyways, the two that stuck in my head were over the Chaos Dreadnought and Pivoting in multiple circumstances. Anyone who has looked at the current rules set under Dreadnoughts can probably see the large change as apposed to what it used to be. Instead of 180 degrees of vision, it's a 45 degree arc from the guns, causing them to be much less crazy than usual. So as the battle started, the first turn resulted in one of his dreads rolling that darned 1. His response to this was to move units as he normally would, and then pivot his dread to avoid any and all units from being in it's fire. Now, I can't say this is bad sportsmanship at all (especially since we dice rolled for this and he lost [which was very gracious of him]) as it is "fair" and "allowed" by the current rules set. 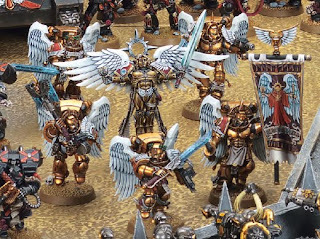 Since the Chaos Marines codex is still floating in the rules of 4th... it falls into one of those pits of old codex rules in a new game rules. To me this was... well annoying. Again this is not a harp on him, nor anyone who would do that, but rather a way to get this type of thing out to the community. I am a firm believer that the new rules have altered the workability of Chaos Dreadnought to the point that it is no long the crazy unit it once was, changing the balance of the unit. The Crazed rule was balanced as it had a plus side and a down side... with the new rules, one can exploit the down side enough to where it is nothing but good outcomes, and to me this is a bit of a bugger. I am not sure if this is GW's intention, but it has happened... and I am not fully sure what to think. As a player from edition's past, this seems strange to me that they would let something like this happen. The other rule I found interestingly annoying is the simple fact that Pivoting does not constitute moving. This means a tank beginning it's turn on the edge of a crater, may in fact pivot off of the crater and move away without a single dangerous terrain test. Again, completely legitimate under the new rules section, but at the same time... what?! I guess it all comes down to what people get from reading the rules. On the one hand, it says "moving through difficult terrain for vehicles is dangers" vs. "pivoting does not count towards moving" (bear in mind these are not direct from the BRRB, and so I am paraphrasing). But hang on... didn't you see the tank move? Does the rule mean it moved in the sense of physically moving or game play terms over moving? I could see an argument on either side for this... but it all sums up with this thought. "Players who recently began playing the game wouldn't think twice about this. They would simply roll the dice, and hope not to get a 1. Players who have played for a while and try to master the rules will find ways to avoid the down sides or exploit the cracks in the rules." I guess to me, the idea of the spirit of the game should come before the exploitation of vague rules. I always try to take rules quarries with a grain of salt, as I am often times wrong about some rules... like I said, after 3 editions, the rules can get mixed up a bit. I'll be the first to admit I'm wrong when I am (see the Adepticon FAQ over Machine Spirit and Smoke Launchers for a prime example of me mistaking old rules). In the end I suppose this article is to help players get an understanding of what the game really is. I am not wanting people to think this is a "you should all just play the way I do and like it" post. Not at all. This post is simply to bring about the views of an older player who has seen some interesting,and at times frustrating tactics. I know I occasionally play like this too (example: http://ritesofbattle.blogspot.com/2010/01/do-transport-hustle.html ) In the end, we all play to win, so go out and play. Just remember that sometimes the rules can be slippery, especially when old rules run into new ones. Good morning everyone, sorry about my long absence but I've been busy so I bring you a piece to think about. We all play 40k, but why? What is it that drives us to spend too much money on plastic space men? Some of us have more of a problem with this than others; Loki for instance, is on his third or fourth aborted army this school year and I simply can't find one I like and finish it. I know I love the tactical side of the game, trying to think ahead and make my opponents react to what I do and make a mistake, but I also love those hours I'll while away painting. What about you, why do you play? For the hobbyist out there here are some pictures from the new blood angels line, enjoy. Even giving that he has to work within the jank confines of the Ork Codex, I do accede that the Deff Rolla will give much-needed anti-tank to an army that doesn't have good ways to take care of AV 14 boxes. Yet, is it being overstated? Most armies already have fast components that are specifically made to break the Raider Rush tactic with incredible efficiency (Pirahnas, Speeders, anything Vulkan). Loki plays a generic Marine list, and my dual Land Raider Chaos list, also known as AV 14 Rhinos, loses them to melta-fire without much of a sweat. How can these wagons be expected to get across the field, into position, and then moving the 13 inches to ram a vehicle? The Kustom Force Field would appear to take care of that, but a number of armies have those wonderful Ordinance Barrage weapons, or can just negate your cover saves like it's their job...which it is. It's needed, it's Orky, and it still depends on your opponent's incompetence. 30khobbyblog | A horus heresy army building blog for the 31st millenium. The Official RoB Gaming Group. Embark at your own risk! Shas'o R'alai: Why oh why?